For the philosopher, see Richard Rufus of Cornwall. Richard (5 January 1209 – 2 April 1272), second son of John, King of England, was the nominal Count of Poitou (1225–43), Earl of Cornwall (from 1225) and King of Germany (from 1257). He was one of the wealthiest men in Europe and joined the Barons' Crusade, where he achieved success as a negotiator for the release of prisoners and assisted with the building of the citadel in Ascalon. He was born 5 January 1209 at Winchester Castle, the second son of John, King of England, and Isabella, Countess of Angoulême. He was made High Sheriff of Berkshire at age eight, was styled Count of Poitou from 1225 and in the same year, at the age of sixteen, his brother King Henry III gave him Cornwall as a birthday present, making him High Sheriff of Cornwall. Richard's revenues from Cornwall helped make him one of the wealthiest men in Europe. Though he campaigned on King Henry's behalf in Poitou and Brittany, and served as regent three times, relations were often strained between the brothers in the early years of Henry's reign. Richard rebelled against him three times, and had to be bought off with lavish gifts. In 1225 Richard traded with Gervase de Tintagel, swapping the land of Merthen (originally part of the manor of Winnianton) for Tintagel Castle. It has been suggested that a castle was built on the site by Richard in 1233 to establish a connection with the Arthurian legends that were associated by Geoffrey of Monmouth with the area. The castle was built in a more old-fashioned style for the time to make it appear more ancient. Richard hoped that, in this way, he could gain the Cornish people's trust, since they were suspicious of outsiders. The castle itself held no real strategic value. The dating to the period of Richard has superseded Ralegh Radford's interpretation which attributed the earliest elements of the castle to Earl Reginald de Dunstanville and later elements to Earl Richard. Sidney Toy, however, has suggested an earlier period of construction for the castle. In March 1231 he married Isabel Marshal, the wealthy widow of the Earl of Gloucester, much to the displeasure of his brother King Henry, who feared the Marshal family because they were rich, influential, and often opposed to him. Richard became stepfather to Isabel's six children from her first husband. In that same year he acquired his main residence, Wallingford Castle in Berkshire (now Oxfordshire), and spent much money on developing it. He had other favoured properties at Marlow and Cippenham in Buckinghamshire. Isabel and Richard had four children, of whom only their son, Henry of Almain, survived to adulthood. Richard opposed Simon de Montfort, and rose in rebellion in 1238 to protest against the marriage of his sister, Eleanor, to Simon. Once again he was placated with rich gifts. When Isabel was on her deathbed in 1240, she asked to be buried next to her first husband at Tewkesbury, but Richard had her interred at Beaulieu Abbey instead. As a pious gesture, however, he sent her heart to Tewkesbury. Later that year Richard departed for the Holy Land, leading the second host of crusaders to arrive during the Barons' Crusade. He fought no battles but managed to negotiate for the release of prisoners (most notably Amaury VI of Montfort) and the burials of crusaders killed at a battle in Gaza in November 1239. He also refortified Ascalon, which had been demolished by Saladin. On his return from the Holy Land, Richard visited his sister Isabella, the empress of Frederick II. After the birth of Prince Edward in 1239, provisions were made in case of the king's death, which favoured the Queen and her Savoyard relatives and excluded Richard. To keep him from becoming discontented King Henry and Queen Eleanor brought up the idea of a marriage with Eleanor's sister Sanchia shortly after his return on 28 January 1242. On his journey to the Holy Land, Richard had met her in Provence, where he was warmly welcomed by her father Raymond Berenger IV and had fallen in love with this beautiful girl. Richard and Sanchia (whom the English called Cynthia) married at Westminster in November 1243. This marriage tied him closely to the royal party. Eleanor and Sanchia's youngest sister Beatrice would marry Charles I of Naples, while their oldest sister Margaret had married Louis IX of France. The marriages of the kings of France and England, and their two brothers to the four sisters from Provence improved the relationship between the two countries, which led up to the Treaty of Paris. Richard was appointed count of Poitou some time before August 1225. However, Richard's claims to Gascony and Poitou were never more than nominal, and in 1241 King Louis IX of France invested his own brother Alphonse with Poitou. Moreover, Richard and Henry's mother, Isabella of Angoulême, claimed to have been insulted by the French queen. They were encouraged to recover Poitou by their stepfather, Hugh X of Lusignan, but the expedition turned into a military fiasco after Lusignan betrayed them. Richard conceded Poitou around December 1243. The pope offered Richard the crown of Sicily, but according to Matthew Paris he responded to the extortionate price by saying, "You might as well say, 'I make you a present of the moon – step up to the sky and take it down.'" Instead, his brother King Henry purchased the kingdom for his own son Edmund. Although Richard was elected in 1256 as King of Germany by four of the seven German Electoral Princes (Cologne, Mainz, the Palatinate and Bohemia), his candidacy was opposed by Alfonso X of Castile who was elected by Saxony, Brandenburg and Trier. The pope and King Louis IX of France favored Alfonso, but both were ultimately convinced by the powerful relatives of Richard's sister-in-law, Eleanor of Provence, to support Richard. Ottokar II of Bohemia, who at first voted for Richard but later elected Alfonso, eventually agreed to support the earl of Cornwall, thus establishing the required simple majority. So Richard had to bribe only four of them, but this came at a huge cost of 28,000 marks. On 27 May 1257 Konrad von Hochstaden, archbishop of Cologne himself crowned Richard "King of the Romans" in Aachen; however, like his lordships in Gascony and Poitou, his title never held much significance, and he made only four brief visits to Germany between 1257 and 1269. He founded Burnham Abbey in Buckinghamshire in 1263, and the Grashaus, Aachen in 1266. He joined King Henry in fighting against Simon de Montfort's rebels in the Second Barons' War (1264–67). After the shattering royalist defeat at the Battle of Lewes, Richard took refuge in a windmill, was discovered, and was imprisoned until September 1265. In December 1271, he had a stroke. His right side was paralysed and he lost the ability to speak. On 2 April 1272, Richard died at Berkhamsted Castle in Hertfordshire. He was buried next to his second wife Sanchia of Provence and Henry of Almain, his son by his first wife, at Hailes Abbey, which he had founded. After his death, a power struggle ensued in Germany, which only ended in 1273 with the emergence of a new Roman King, Rudolph I of Habsburg, the first scion of a long-lasting noble family to rule the empire. In Cornwall, Richard was succeeded by Edmund, son of his second wife Sanchia. John of Cornwall (31 January 1232 – 22 September 1232), born and died at Marlow, Buckinghamshire, buried at Reading Abbey. Isabel of Cornwall (c. 9 September 1233 – 6 October 1234), born and died at Marlow, Buckinghamshire, buried at Reading Abbey. Henry of Cornwall (2 November 1235 – 13 March 1271). Known as "Henry of Almain" (Germany), he was murdered by his cousins, the Montfort brothers Guy and Simon. He was buried at Hailes Abbey in Gloucestershire. He had no children. Nicholas of Cornwall (b. & d. 17 January 1240 at Berkhamsted Castle), died shortly after birth, buried at Beaulieu Abbey with his mother. unnamed son (Jul 1246 – 15 Aug 1246), died in infancy. Edmund, 2nd Earl of Cornwall (26 December 1249 – before 25 September 1300), usually styled Edmund of Almain. 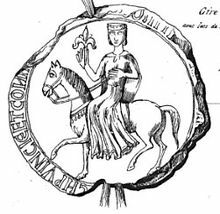 Edmund married Margaret de Clare (1250 – shortly before Nov 1312), daughter of Richard de Clare, Earl of Gloucester by his second wife Maud de Lacy, daughter of John de Lacy, 2nd Earl of Lincoln. Edmund and Margaret had no children. Their marriage was annulled in February 1294. Richard's third wife, Beatrice of Falkenburg, whom he married on 16 June 1269 at Kaiserslautern, was the daughter of Dietrich I, Count of Falkenburg, of Valkenburg Castle in the Netherlands, and was said to be one of the most beautiful women of her time. Her father was a supporter of Richard's claim to the throne of the Holy Roman Empire. The two men fought on the same side in a battle, at which time Richard met Beatrice and grew besotted by her. There was a very large difference in age between them: at the time of their wedding in 1269, she was about fifteen years old whereas he was in his sixty-first year. Indeed, the youngest of Richard's children was only four years older than Beatrice. Richard doted on his young wife, and she had a high regard for him, but they produced no children. Beatrice survived Richard by only five years and never married again. She died on 17 October 1277 and was buried before the high altar at the Church of the Grey Friars in Oxford. Richard also had several documented out-of-wedlock children. One of Richard's mistresses was Joan de Vautort, widow of Ralph de Vautort (d.1267), feudal baron of Harberton, Devon and Trematon, Cornwall. Joan later married Sir Alexander Okeston, lord of the manor of Modbury in Devon, which manor, part of the Vautorts' feudal barony of Harberton, had been granted him by Roger de Vautort. Joan bore her second husband a son and heir, Sir James Okeston. Philip of Cornwall, a priest. Sir Richard of Cornwall, who received a grant from his half-brother Edmund, 2nd Earl of Cornwall, (d. 1300) in which he was called "brother". He married Joan FitzAlan, daughter of John FitzAlan, 6th Earl of Arundel, and by her had three sons and a daughter. He was slain by an arrow at the Siege of Berwick in 1296. His daughter, Joan of Cornwall, married Sir John Howard, from whom the Howard family, Dukes of Norfolk, are descended. Sir Walter of Cornwall, who received a grant of the royal manor of Brannel, Cornwall, from his half-brother Edmund, 2nd Earl of Cornwall (d. 1300) in which he was called "brother". He was ancestor of the Cornwalls of Branell. Isabel of Cornwall, who received a grant from King Henry III in which she was called "niece". Joan of Cornwall, daughter of Joan de Vautort, in 1283 received a grant from her half-brother Edmund, 2nd Earl of Cornwall (d.1300) in which she was called "sister". The younger Joan married twice, firstly to Richard de Champernowne (2nd son of Sir Henry Champernowne of Clyst Champernowne, Devon), by whom she had a son, Richard de Champernowne, and secondly, Sir Peter de Fishacre, of Combe Fishacre and Coleton Fishacre, Devon, by whom she had no issue. Her childless half-brother Sir James Okeston made her son or grandson Richard de Champernowne his heir. ^ Weis 1992, p. 232. ^ Lundy, Darryl (21 January 2011). "Richard, 1st Earl of Cornwal". The Peerage. ^ Historic England. "Merthen (1142128)". National Heritage List for England. Retrieved 16 January 2012. ^ Cox 1974, p. 114. ^ Sanders, IJ (1951). "The Texts of the Peace of Paris, 1259". The English Historical Review. 66 (258). Oxford University Press. pp. 81–97 . ^ a b Weir 1999, p. 67. ^ Cox 1974, p. 112-113. ^ Craik, George L., & Macfarlane, Charles, The Pictorial History of England, p. 657. ^ Goldstone, Nancy (2007). Four Queens: The Provençal Sisters who ruled Europe. New York: Viking. p. 217. ISBN 978-0-670-03843-5. ^ Richardson I 2011, pp. 566–71. ^ a b Richardson I 2011, p. 567. Richardson, Douglas (2011). Everingham, Kimball G. (ed.). Plantagenet Ancestry: A Study in Colonial and Medieval Families. I (2nd ed.). Salt Lake City. ISBN 1449966314. Weir, Alison (1999). Britain's Royal Families: The Complete Genealogy. London, U.K.: The Bodley Head. Weis, Frederick Lewis (1992). Sheppard, Walter Lee; Faris, David (eds.). Ancestral Roots of Certain American Colonists who Came to America Before 1700: The Lineage of Alfred the Great, Charlemagne, Malcolm of Scotland, Robert the Strong, and Some of Their Descendants. London, U.K.: Genealogical Publishing Com. ISBN 9780806313672. Denholm-Young, Noël. Richard of Cornwall. Oxford: Basil Blackwell, 1947. Jackson, Peter. "The Crusades of 1239–41 and their Aftermath". Bulletin of the School of Oriental and African Studies 50, 1 (1987), pp. 32–60..
Lewis, Frank R. "Beatrice of Falkenburg, the Third Wife of Richard of Cornwall". English Historical Review 52, 106 (1937), pp. 279–82. Lower, Michael. The Barons' Crusade: A Call to Arms and Its Consequences. Philadelphia: University of Pennsylvania Press, 2005. Painter, Sidney. "The Crusade of Theobald of Champagne and Richard of Cornwall, 1239–1241". R. L. Wolff; H. W. Hazard, A History of the Crusades, Volume II: The Later Crusades, 1189–1311, pp. 463–86. Madison: University of Wisconsin Press, 1969. Roche, T. W. E. The King of Almayne: A 13th-Century Englishman in Europe. London: John Murray, 1966. Schwab, Ingo. "The Charters of Richard of Cornwall for the Empire". Thirteenth Century England 12 (2009), pp. 183–92. Vincent, Nicholas. "Richard, first earl of Cornwall and king of Germany (1209–1272)". Oxford Dictionary of National Biography. 2008 online [2004 print]. Weber, F. P.. "Richard, Earl of Cornwall, and His Coins as King of the Romans (1257–1271)". The Numismatic Chronicle and Journal of the Numismatic Society, Third Series 13 (1893), pp. 273–81. Weiler, Björn. "Image and Reality in Richard of Cornwall's German Career". English Historical Review 113, 454 (1998), pp. 1111–42. Charter given by Richard as German King to the town of Zürich, 20.11.1262. Photograph taken from the collections of the Lichtbildarchiv älterer Originalurkunden at Marburg University showing Richards's seal. Wikisource has the text of the 1911 Encyclopædia Britannica article Richard of Cornwall. Wikimedia Commons has media related to Richard of Cornwall.